A legendary destination, New York shines and glitters with a thousand lights, offering visitors emblematic monuments, a multicultural restaurant experience and its renowned museum districts. Explore the “Big Apple” while staying in one of our Novotel hotels, where you will be cocooned in a warm and modern setting. It is hard not to be caught up to the frenzy of New York’s streets. The city is divided into five boroughs: Brooklyn is home to artists; Queens is multi-ethnic and has the best Greek, Albanian, Indian and Korean restaurants of the city; the Bronx is where you go for an authentic Italian meal; there is Staten Island; and then there is Manhattan: an emblem of the city, where you can discover neighbourhoods like SoHo and Greenwich Village; the Metropolitan Museum of Art, a huge museum containing an authentic Egyptian temple 25 metres high, European and mediaeval art galleries, etc. For those who love the 20th century, MoMA is the place to visit. While you are in New York, discover the frenzy that is Times Square, Wall Street, Broadway, the Rockefeller Center, the Empire State Building, Brooklyn Bridge, the Statue of Liberty and a recent addition, One World Trade Center. A sprawling metropolis that never sleeps, New York is replete with things to see and larger-than-life experiences. 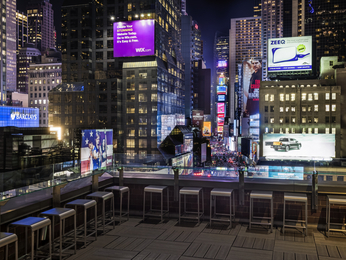 Explore the city from our Novotel hotel in Times Square to benefit from an exceptional central location.